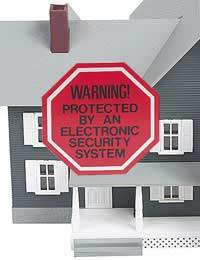 There are a wide range of systems available to give extra security to a home. Whilst some of these systems can be expensive, they will give some peace of mind especially in areas with a high crime rate or for properties which contain high value items. All police stations have an officer or officers who specialise in crime prevention advice and some will visit homes to give advice on security methods that could usefully be installed. In addition, the insurance company providing buildings and/or contents insurance for the property may be able to advise on the companies or types of system that the householder should use. Monitored systems – when activated these alarms notify a remote monitoring station, or “Alarm Receiving Centre”. The monitoring station will then notify a person who has been nominated by the householder and, possibly, the police. Naturally, these systems are more expensive because, in addition to installation and maintenance, there will be a fee for the monitoring service. Audio-only alarms will still have a strong deterrent effect – a burglar is less likely to break into a house with an alarm and is very unlikely to linger if the alarm is ringing. However, the false alarm is such a common feature of modern life that they could be ignored when there is a real incident. Monitored alarms offer an extra level of security because assistance will be sent to the property. The police will only monitor alarms which have been installed by a company which complies with the Association of Chief Police Officers’ security policy – and there are very few companies which meet the rigorous standards set by the police. The police will, however, still respond if they are notified that an alarm is ringing by someone who has heard it. Alarms are controlled by a key or keypad and it is usually possible to select coverage of particular parts of the property. For example, the alarm may be switched on downstairs when the occupants go upstairs to bed. Home alarms can also be fitted with panic buttons allowing a householder to call for assistance if an intruder is in the house even when the alarm itself is switched off. Many of the more sophisticated systems will have to be installed and serviced by a specialist company. Before choosing a company, householders must check the company’s credentials and make sure that the equipment they install complies with British or European standards. Householders should never agree to have a security system installed by a company who employs cold-calling or doorstep selling techniques. The company fitting the system – or just providing a quote – should carry out a full risk assessment before recommending a system suited to the householder’s needs. In some cases insurers demand a particular type of security system and the company carrying out the risk assessment should incorporate these requirements into their recommendations. Even if an insurance company has not demanded that a security system be installed, having one put in is likely to result in lower insurance premiums. Some types of alarm can be fitted by householders themselves. However, the police do not recommend this because the householder is unlikely to have a real understanding of their security requirements and may not install the alarm properly. Perimeter devices – these devices can be left switched on when people are using the room or area which they cover and will activate the alarm if, for example, glass is broken. Homes and their surroundings can be monitored by CCTV. Signs warning that it is in use may be enough to deter opportunist burglars who prefer not to get their face on camera. These systems can be monitored from within the home or remotely by a security service. These are most likely to be used in flats where residents will have to answer the door to people who are not visible to the occupant. These can be voice-only or video and give the householder the opportunity to verify a caller’s credentials before deciding whether to let them in. People who live in houses with large gardens may find that an electronic gate combined with a remote entry system will give a heightened sense of security. @jango. We don't have the facility to offer help with installations etc, but if you search CCTV cameras online or go to any large electronics store you will find what you need.